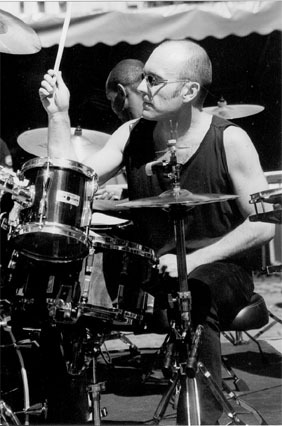 Born and raised in Charleroi (Belgium), Marc van Eyk started playing drums on soap boxes at the age of eight. 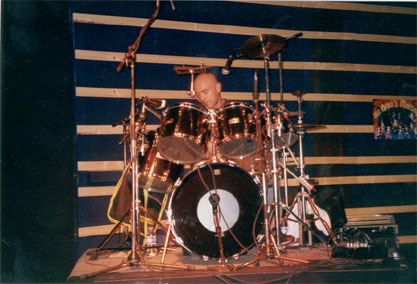 In 1994, he fell in love with a Yamaha Custom Record (made in UK) in a second hand shop in Brussels: 4 Toms 8", 10", 12", 14" and a 22" BassDrum. In his own words: "Wherever I play 'she' sounds good, tuned or not, amplified or not, in a small club or on a huge open air stage, in a cathedral or in my basement!. I kept my old snare drum: a too heavy 14" Sonor Signature. I play on Paiste cymbals but I can't hear high tones (nothing higher than 5K, after an infantile decease) that's why, I think, most of my (famous) patterns (ha ha) include only toms! I always mix acoustic and electronic sounds, ethnic and futuristic rhythm, world and Belgian inspiration. To experience this yourself, come and see us live!" Marc van Eyk has played with numereous bands like Largo with whom he toured in Europe (Amsterdam, Berlin, Brussels, Cologna, Barcelona, Budapest, Lissabon, Paris, Tananarive, Tilburg...) and Canada. 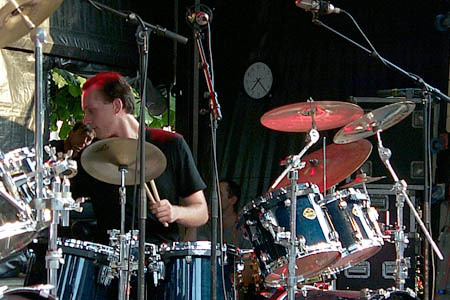 Since 1999 Marc van Eyk has played in Dalton Drum Syndicate: four drummers on one stage, featuring Renaud van Hooland, Didier Fontaine and Maxime Lenssens along van Eyk himself.